We study a framework for the specification of architecture styles as families of architectures involving a common set of types of components and coordination mechanisms. 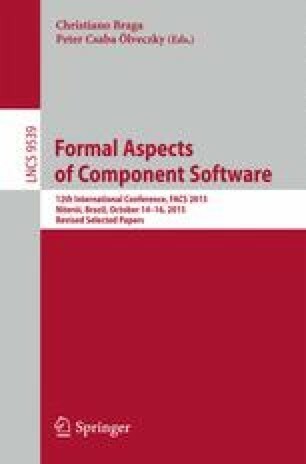 The framework combines two logics: (1) interaction logics for the specification of architectures as generic coordination schemes involving a configuration of interactions between typed components; (2) configuration logics for the specification of architecture styles as sets of interaction configurations. The presented results build on previous work on architecture modelling in BIP. We show how propositional interaction logic can be extended into a corresponding configuration logic by adding new operators on sets of interaction configurations. We provide a complete axiomatisation of the propositional configuration logic, as well as a decision procedure for checking that an architecture satisfies given logical specifications. To allow genericity of specifications, we study first-order and second-order extensions of the propositional logic. We provide examples illustrating the application of the results to the characterization of architecture styles. Finally, we provide an experimental evaluation using the Maude rewriting system to implement the decision procedure for the propositional logic.